This online multidisciplinary project is part of the Center for Improved Engineering and Science Education (CIESE) program, which has developed internet activities for the elementary, middle, and high school level student. It utilizes both real time data and primary source materials to help guide students to discover the science and history of the Gulf Stream. Students investigate the driving forces behind this great ocean current, how it affects the Atlantic Ocean, and some of mankinds experiences in dealing with it. 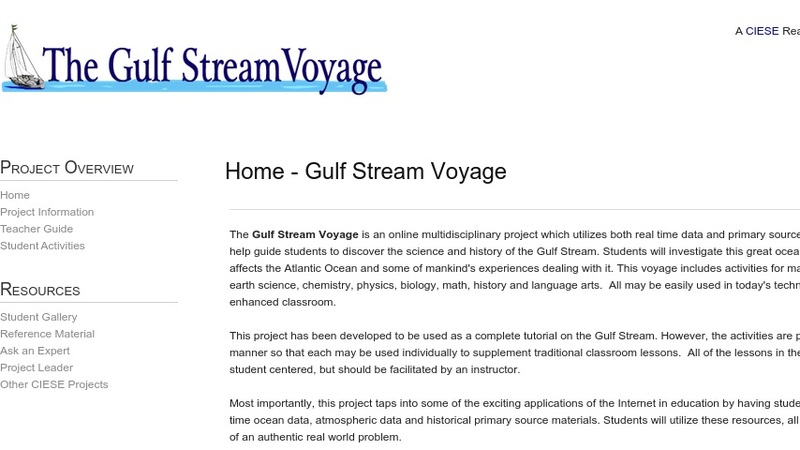 This project can be used as a complete tutorial on the Gulf Stream, however, the activities are presented in a manner that allows each to be used individually to supplement traditional classroom lessons. The project provides instructions, activities, worksheets, data links, reference materials, on-line help, back-up information, and a teacher area for help and ideas.